For more information on the school calendar, upcoming events or Polk school information, please visit the Polk County Public Schools website (where we gathered our information) at www.polk-fl.net. Click for Polk County testing information. For those of you in high school planning to tackle the ACT or SAT this fall, please consider our test preparation courses where our goal is to help you achieve your best score. Expect to learn problem-solving strategies for analyzing and answering exam questions, take practice exams, and study test-taking techniques and strategies specific to each exam. Now is the time to register! The next ACT test date is scheduled for October 24, 2015; while the fall SAT test dates are scheduled for October 3, 2015, November 7, 2015, and December 5, 2015. Calm your test anxiety, and make sure you’re prepared with our ACT Preparation Course on September 14-October 14, 2015 or one of three SAT Preparation sessions on September 1-September 24, 2015, September 29-October 22, 2015 or October 27-November 19 at the Learning Resource Center of Polk County. Find more on the course developed around the test you’re planning to take below. Register: Register online at lrcpolk.com/programs/act-preparation or call 863-688-9477. Register: Register online at lrcpolk.com/programs/sat-and-psat-preparation-program or call 863-688-9477. 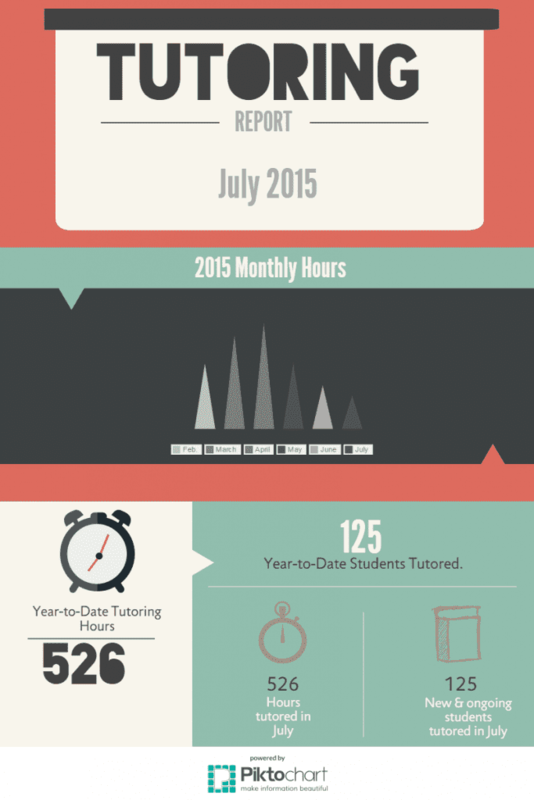 In the month of July, Learning Resource Center students received 526 hours of tutoring, bringing the Year-To-Date Total to 526 hours (please note that the YTD total starts over in July). New and ongoing students tutored during the month of July equaled 125 students. You can play a role in the success of the Learning Resource Center of Polk County, Inc. by lending your time, knowledge and efforts. Have a part in helping the organization thrive by becoming part of the LRC team as a tutor or a volunteer. If you have a passion for teaching, desire a flexible work schedule, enjoy creative freedom, and want to make a difference in the life of a student, then tutoring may be for you! The Learning Resource Center is looking for certified teachers or qualified candidates to inspire and motivate students throughout Polk County with one-to-one and small group positions. Tutors will receive competitive hourly rate as well as flexible scheduling. LRC tutors consult with their clients to decide when and where to tutor. Tutoring may take place at any of the following locations: LRC, public library, school (with permission from principal), local business, church, etc., and sessions are typically one to two hours per week. Another thing to note is that LRC handles monthly billing, so tutors do not have to worry about collection of fees. Apply today by completing the Application for Employment. Positions are available throughout Polk County. Please mail your completed application or stop by to drop it off in person at 1628 South Florida Avenue, Lakeland, FL 33803. Once you application is received, a Program Manager will contact you to schedule an interview. In the meantime, if you have specific questions, please call LRC at 863-688-9477 and visit the FAQS webpage. Volunteers are indispensable to the organization. If you are able to fully support the LRC Mission and Vision, can communicate those to the community, demonstrate good customer service skills, and work well in a team environment, you are most likely qualified to become an LRC volunteer. Volunteers with direct access to students will be asked to complete a background check. Also, please note that certain volunteer assignments may have age restrictions. To learn how you can volunteer with LRC this year, please contact Judi Weiss at JudiW@lrcpolk.com, call LRC at 863-688-9477 or visit LRC online at lrcpolk.com/get-involved/volunteer to complete the appropriate volunteer application. Please note that court-ordered community service is not part of the volunteer program. LRC looks forward to the possibility of working with you and helping the organization grow.